Phi has been enjoying a rich run of form with his crosswords over the last 3 or 4 weeks, and for me this was the best of them – worthy of Puzzle of the week status I thought, even if the praise over on Fifteensquared is less than fulsome – ‘Clever rather than fun’, says one… Eesh, there’s no pleasing some people! Each across clue was for a two-worder split across the lights of consecutive rows, so that they all flowed together and from the bottom round to the beginning again. And the clues were just the sort I like –plenty of challenge to unpick the complexities, but no need for a dictionary or going on-line. 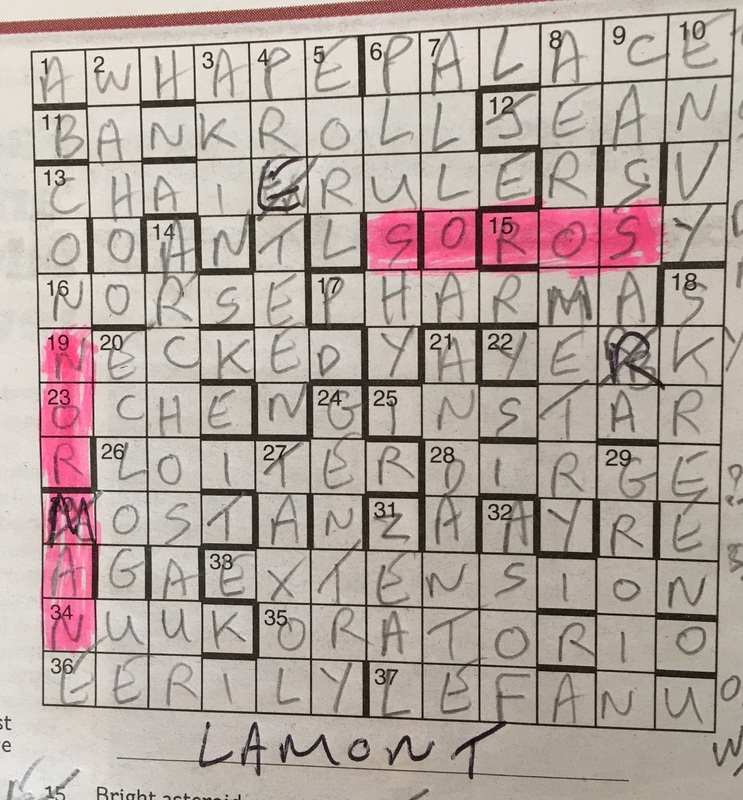 Tyrus which in the crossword world is usually a synonym for tough appears to have excelled himself with todays offering. I spent a long time looking at a grid where only 7ac, 10ac, 23ac, 5dn and 7dn were solved, it wasn’t that the answers themselves were very obscure, although 2dn and 16dn were new to me and 6dn and 14dn are both terms I was unfamiliar with but the wordplay was devious to the extreme resulting in quite a few being solved from the synonym only with a complete lack of understanding of the cryptic part. I am not alone in finding this extremely difficult and needing electronic help to finish as most of the good folk on Fifteensquared report similar experiences even the redoubtable RatkojaRiku who makes an excellent job of parsing it. You will also find an apology from the setter! Morph is one of the setters I enjoy most in the i (and previously in the Independent), with today’s puzzle one of his best. It took a little getting into – my first clue solved was 22ac – but from that point on it was pretty plain sailing, albeit with a few left unparsed at the close. 7d was chief amongst them, and kudos to Pierre over on the other side for explaining it, because I never could. A 9 letter word, though, starting with K?T, and with a pretty well flagged up definition of seagull, was unlikely to be anything else. Lots of invention elsewhere, and lots of smiles, as you expect from this setter. LOI 24ac, with a finish time under par for the i.
COD? 8d – “Celebrities getting out? One joining in for possible means of going to ground (6,2,6)”. Our second IoS reprint of the week comes courtesy of Hypnos, and is pitched at about the level you’d expect. That said, it took me a while to make headway, probably because I made heavy work of the anagrams at 1ac and 5d. Entering the answer for 21ac at 11ac probably didn’t help matters either, but never mind. 14d I needed to check, given my pitiful knowledge of football, but that was the only unknown. COD? 5d – “Shift in political soul that’s outwardly deceptive (7,8)”. Should that fail, try the Internet Archive. So after last week’s struggles, something a little easier perhaps? Quite a long preamble, but the gist of it seems to be extra letters from the wordplay, a handful of clashes, a spot of highlighting, a name to write below the grid. Onwards, with a hard rain driving outside. The joys of an Indian Summer. The last three downs don’t have any extra letters, so are presumably normal clues? Yes they are, all three falling in a flash. Is the rest going to be this straightforward? Yes again, with the grid filling steadily from south to north west, and just the three clashes. The end game’s going to be a pig, surely? Well, no, as it turns out. A couple of spurious extra letters in the acrosses (so what’s new, I hear you cry), but they’ve got to read GEORGE BLACK WEDNESDAY. Well, I can remember that quite clearly. Grown men sweating over spreadsheets trying to work out how soon they were going to default on their mortgage payments as interest rates rapidly spiraled. Who said that politics was dull? The first protagonist? George SOROS, who appears to have done very well out of the whole thing. The second? No sign of John Major, but, there he is, our hapless former Chancellor of the Exchequer, NORMAN LAMONT, and that’s the surname to write under the grid. The extra letters from the down clues? I never did make sense of those, I’m afraid to say, but the rest was thoroughly enjoyable, a fine way to spend a wet Saturday afternoon. Edited to add: Whoops, looks like I missed something by not getting those down letters, if you look over at Fifteensquared That’ll learn me! Next time, take note when the preamble says “provide decisive thematic information”. A definite win then for Gila, and a trap I fell hook, line and sinker for. This worked perfectly for me: a puzzle with a ghost theme which I spotted, but only after completion. I therefore have the double satisfaction of having solved it without a suspicion of what ought to be lurking in there, plus the “aha” moment. If you’re thinking “theme? what theme?”, all is revealed by Alchemi himself over at Fifteensquared in comment 8, where he also unburdens himself of some trenchant views on what is and isn’t worthwhile in this context, which I happen to share. Solved in an instant; thorough parsing took a lot longer. An IoS reprint to start the week, which was for the most part pretty easy going. A few unfamiliar answers meant it took a little longer than usual for Raich, but they were all perfectly gettable from the wordplay and a little common sense regarding the likely order of some letters. 🙂 First in 1ac, which is always a good sign, last in 3ac, which was definitely among the list of unfamiliar answers. With lots to enjoy as ever from Raich, COD goes to 10ac – “In Accrington, home (not originally! ), I’m mobile (upwardly?) (8,7)”. A super puzzle from Phi last Saturday which reminded me of the early days of the i, when the paper cost 20p and Phi, along with Virgilius, was my favourite setter. 29/9 meant Tempest character, of course, and we had to discover Prospero, Ariel, Caliban, Ferdinand and Stephano. To shoe-horn a couple of 15-letterers into the grid along with the theme was quite a feat, and I found the whole thing very pleasing indeed. Some discussion over on Fifteensquared as to whether the Caliban clue is breaking the ‘double duty’ rule. I took ‘imprisoned?’ to be a cryptic direction meaning ‘put in the can’ – a bit like ‘on board’ for put in SS – so with the question mark it was definitely fine in my book. Also an enigmatic comment from Phi at comment 16 – will we find out today? COD? Too many to choose from today, but I’ll go with 29ac – “Not initially taken by Gay Rabbit? Gone one better (7)”.